Hot, dry, windy. Long, twisted, beige and russet strips of palm tree bark skitter across the road. Brittled fronds follow, looking a bit like rejects from a broom factory. I sit at a stoplight, waiting, watching. Two errands: Complete the registration for my California Seller’s Permit; go to the nearest post office and buy stamps. First errand goes well—I find the sprawling, two-story, non-descript office building where the Board of Equalization is and follow a few signs up stairways and down hallways to get to the office. All is well. 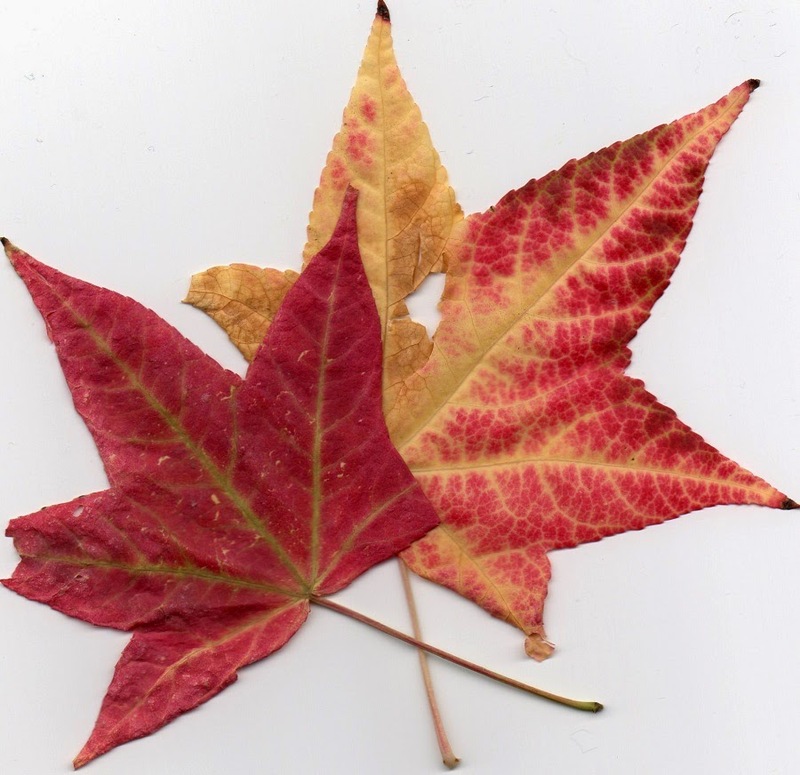 But then, upon leaving the building, right outside the door, I see two beautiful autumn leaves. I pick them up. A few days ago my brother-in-law was saying that it felt like autumn, that fall was in the air. I wondered about that—to me it was simply another sunny day in the mid-70s with flowers blooming all around. Where in that was autumn? It was a touch cooler, I was told, subtle, perhaps, but there. Fall. And I felt somewhat wistful, wished I could feel it, too. Then there was that morning when the cottage was dark and quiet, stuck in a thick fog, and it was cool and damp with moisture on the windowsills. About two hours later, though, when I looked up from my tea and work and had gotten dressed and all that, it was clear and sunny and warm. Josie and I had a delightful walk. But, a couple hours after that, a hot, dry wind was blowing. Ninety-seven degrees and palm bark skittered like sagebrush down the road. In another few hours the wind turned, became a cool, salty breeze. Down at the beach the surf was up and the surfers were out. Gulls and pelicans dove and soared and bobbed on the waves right alongside. Fishing boats headed out into the sparkling water. Who ever said California weather is boring? So I pick up these two autumn leaves and continue on with my second errand but am slightly distracted by thoughts of autumn and unfortunately right then, when I should have been paying attention to street signs and such, I pass a huge, flat field of pumpkins baking in the sun and I don’t realize that the left turn lane I willingly get into is funneling me onto the freeway. When the realization hits I swear, and swear again. I do not want to be on the freeway, not to get to this post office and not in general. One must often take the freeway to get to where one is going around here, and often it is the best way to go, but right now my personal quest is to find my way to as many places as possible without using the freeway. I like driving more slowly through fields of pumpkins, strawberries, and avocado trees, down streets that go through business parks, past shopping malls and housing developments, up streets lined with small businesses, passing the occasional school or park. But right now I am on the freeway again, ripped from my autumnal musings and sometimes, of course, a wrong turn is exactly what you need, but other times, like right now, it is just irritating. And on the freeway here it seems not so simple as just getting off at the next exit, turning around, getting back on; these roads are simply not as neatly laid out as elsewhere, like other places I’ve been, like Chicago, or maybe I’m just, like, new here and don’t get it yet, but once when I missed a highway split in Minneapolis I got off at the next exit, had a sense of where to go and got right back on the highway finding my way without consternation. And now that I’m thinking about it, the same kind of thing happened in Duluth, twice. But this ain’t Duluth. I get off the freeway, drive around a bit, get back on the freeway then off again ... Phew. More big hunks of palm bark skitter across the road. Back on track but now it’s a little weird. I have lost confidence. Then I catch sight of the post office down an angled street off to the left in an old, narrow strip mall right there between GiGi’s Cocktail Lounge and The Hair & The Hound pet grooming parlor. It’s a nice, small, neighborhood post office with nary a wait, and the clerk is very nice. 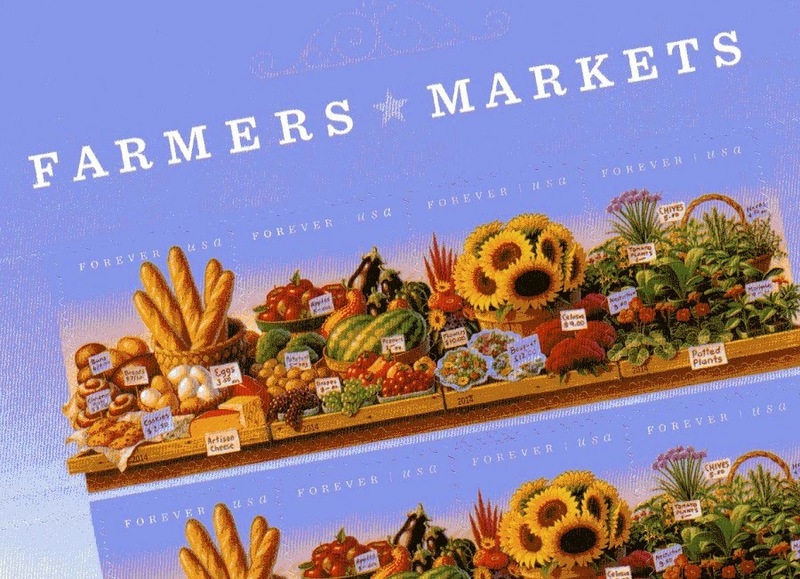 We agree the Farmers Markets stamps are the best. I pretty much know my way home, pass by pumpkin fields, run over a few palm fronds, and later on I celebrate avocados, which is very much a fall-type thing to do around here.